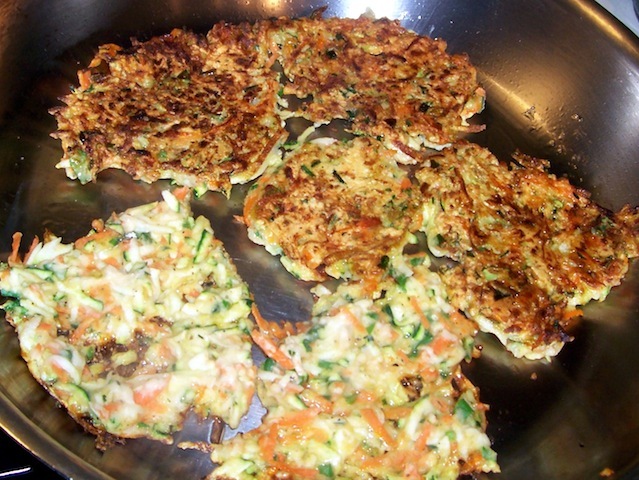 Susan's Cooking School: Zucchini Carrot Pancakes! I love zucchini and pretty soon it will be quite plentiful here in upstate New York. A great way to prepare zucchini is to make zucchini pancakes, which I have made many times in the past. However, I sought to make a version that were a little less like breakfast "pancakes" in texture. 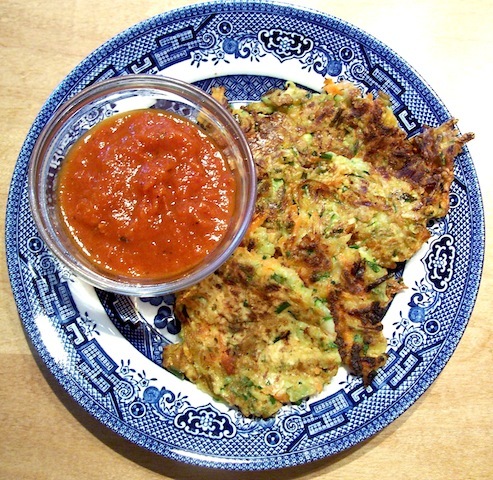 Because zucchini has such a high moisture content, the pancakes can come out a bit soggy. Aiming for something crispier and more colorful, I came up with the following recipe. Hope you like it! Mix the zucchini and salt in a bowl and let sit for 5-10 minutes. Squeeze the zucchini over a colander to get out the excess liquid and place back in bowl. Add remaining ingredients and stir to incorporate. Heat frying pan and add a little oil. When hot, drop dollops (I used about 1/4 cup for each) of batter onto the pan and spread each out gently with a fork. Flip when the bottom turns brown and cook on the other side. Add more oil when necessary. I decided to serve these with some tomato sauce I had in the fridge, but sour cream or yogurt is great too! Hi Susan, there is a very similar Turkish recipe like this one. It is called `Mucver`. It has dill and/or parsley in it. You can give it a try!